PRICES ARE ACTUALIZED BY THE RUBLE COURSE on May 13, 2015 (0.45 CPC). PRICES MAY CHANGE. REFINE AT THE BOOKING. Guest house "Ayat" is located in the village of Rybache, 700 meters from the beach. 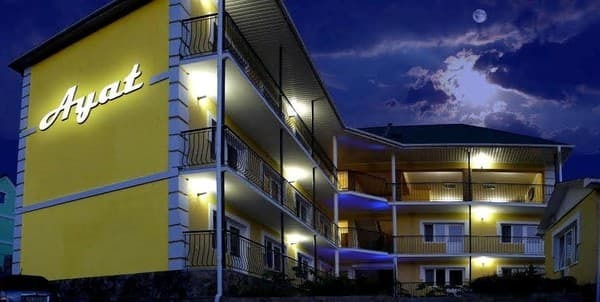 The hotel opened in 2013 and offers its guests to relax 20 modern comfortable rooms of "standard" and "comfort" categories. 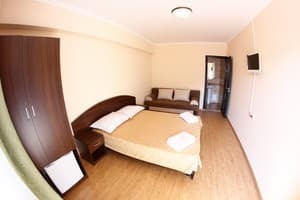 Each room is equipped with one double or two single beds (depending on the category of the room), a sofa with an euro-book, a wardrobe, a mini-bar, a refrigerator, a flat-screen TV with cable channels, an individual bathroom with a shower, a set of towels and toiletries accessories. The comfort rooms also feature a safe and a fan. The number of the corresponding category can accommodate 2, 3 or 4 people. In the hotel there is a laundry (paid service), Wi-Fi access, free parking for cars, a playground for kids, a brazier, a gazebo. On the 3 rd floor of the Ayat guest house there is a cafe, where delicious breakfasts are served, are included in the price. Also in the cafe you can order yourself dishes of oriental and European cuisine to order on the menu. The distance to Alushta is 30 km, Simferopol - 68 km. Description of the room: Bright room with an area of ​​18 sq.m., equipped with a double or 2 single beds, wardrobe, sofa. Description of the room: Bright room with an area of ​​18 sq.m., equipped with one double or two single beds, wardrobe-wardrobe, sofa. Description of the room: Spacious room with double bed, sofa bed, wardrobe. 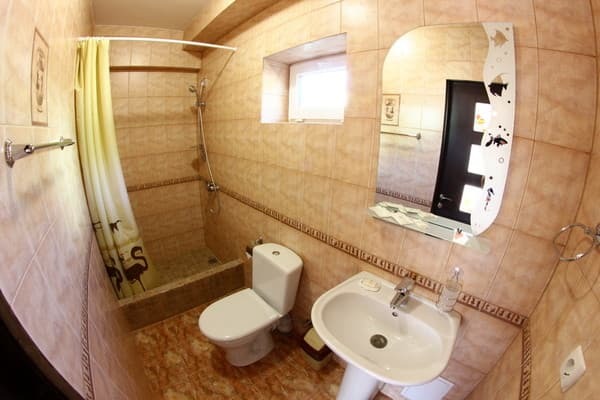 Description of the room: Bright room with an area of ​​22 sq.m. equipped with one double bed, wardrobe-wardrobe, sofa bed. Description of the room: Spacious room, equipped with a double bed, sofa bed, wardrobe. Description of the room: Bright room with an area of ​​22 sq.m., equipped with a double bed, wardrobe-wardrobe, sofa bed. Children under 3 years of age inclusive are accommodated free of charge without providing additional space. The price includes breakfast. 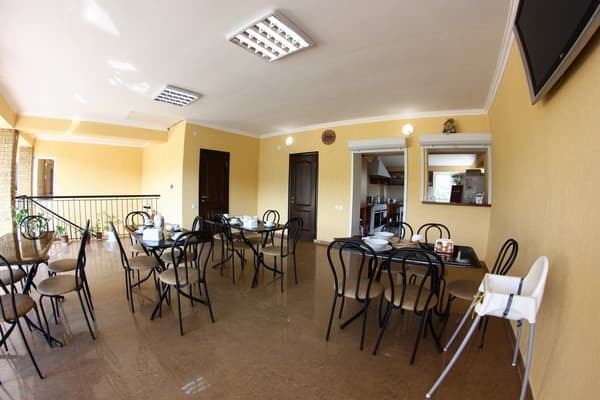 Lunch and dinner can be ordered separately in the café of the Ayat Guest House. Guest house "Ayat" is located in Rybachye (Big Alushta) on the border of the Southern and Eastern coasts of the Crimea. Known for its most extensive beach in Crimea with small pebbles, in this village the maritime climate of the Southern coast is connected with the clean air of the Mountainous Crimea. From the guest house to the sea 700 m or 10-12 minutes of unhurried walk. "Ayat" is located far from the noise of the central street, and therefore it is suitable for recreation both for families with children and for those who are just looking for silence and the sea. The distance to Alushta is 30 km, Simferopol - 68 km. You can reach the bus station Rybachye by taxi or bus from Simferopol, Alushta or Sudak. You can get to Alushta by trolleybus No. 51 or No. 52, then by bus to Rybachiy, or by direct flight from Simferopol. There is a possibility to use the transfer service from Simferopol to the guest house.